Early in 1993, with the help of the Culture of Peace Working Group, I had begun preparations for pilot projects in El Salvador and Mozambique. After extensive discussions throughout UNESCO, I engaged two people to join the Working Group for these pilot projects, Luis Barriga, a collaborator with Gonzalo Abad for the El Salvador project, and Luis Tiburcio, a Portuguese staff member working with Leslie Atherley in the Education sector for the Mozambique project. Luis Barriga went on mission to El Salvador from 13-24 March using funds from our budget, and I later went on mission myself from 27 May to 2 June. In El Salvador, the National Forum of Reflection on Peace Education and Culture on 28 April 1993 resulted in a Memorandum of Understanding signed by Director-General Mayor, the Minister of Foreign Relations and the Minister of Education of El Salvador to launch a national culture of peace programme. It also adopted the San Salvador Appeal that was presented by the Director-General "to promote the apprenticeship and practice of the Culture of Peace." 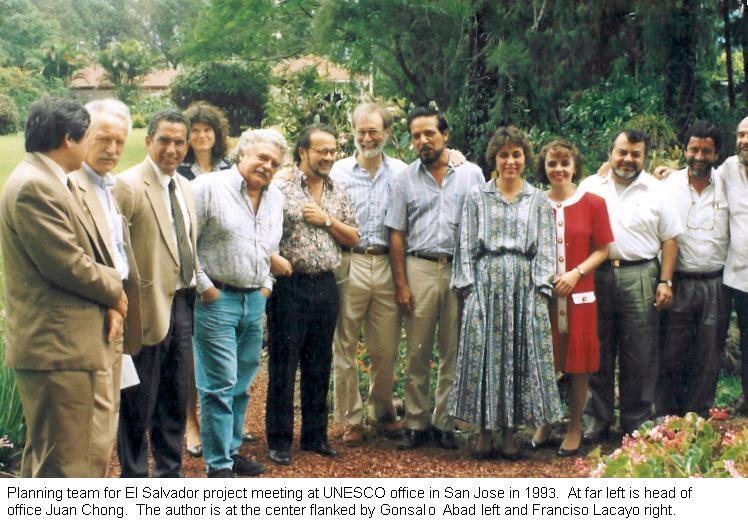 A series of projects involving both sides of the El Salvador conflict were developed by workshops held involving representatives of the two sides of the previous civil war, the Government of El Salvador on one hand and the NGOs associated with the FMLN revolutionaries on the other hand. This process, literally cross-conflict participation in practice, was under the direction of Francisco Lacayo who had been engaged by Juan Chong, the UNESCO representative for Central America based in San Jose. Francisco had been responsible for the great literacy project of the Sandanistas in Nicaragua after the revolution. 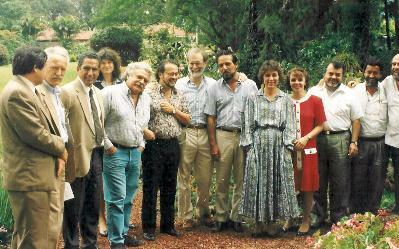 The El Salvador projects included democratic citizenship, training of local leadership for project management, education for sustainable development, scientific development, youth programmes, support for popular culture and crafts production, book production, community museums, a national center for culture, library services support for indigenous populations, basic education, citizenship training, human rights education, radio for rural women, special projects for rehabilitation of children hurt by the war, and training of peace promoters for cross-conflict participation. Project documents were prepared to be submitted for international funding. These project documents, prepared by Chong, Lacayo and other consultants were bound into the "Blue Book" and published in September 1993.